Made enhancements and clarifications to the Inland Port legislation with unanimous support from stakeholders involved in negotiations. Approved a $30 Million tax credit for Utah families who would be hit the hardest by federal tax reform. Allowed for millions in state sales taxes to be collected on online purchases from out-of-state companies affected by a recent U.S. Supreme Court ruling. Made other needed clarifications and corrections to legislation passed earlier this year. We also consented to the proposed appointments made by the Governor and confirmed three new judges: Judge Don Torgerson, Judge D. Scott Davis, Judge Debra Jensen Merkley. During the 2018 Legislative Session, we seized upon one of the largest economic development opportunities in the history of the state by beginning the process to create an inland port. In an effort to improve the bill passed at the end of the session, the Governor, Legislature and Salt Lake City Council met for negotiations to rework some of the bill. The compromise that was reached was unanimously supported by all stakeholders involved in the negotiations - including the entire Salt Lake City Council. HB 2001 , Utah Inland Port Authority Amendments, reduced the size of the land designated to the inland port, addresses tax increment and local land use authority, and provides more environmental protections. This is only the beginning, as we expect to regularly be adjusting statue as the project continues. This bill passed both chambers. Within the past year, both the federal government and state government have passed tax reforms. At the time we passed our tax reforms, it was still not quite clear what impact the federal reform would have on the state. As a result of the federal government repealing the exemptions for children, some Utah families would be faced higher state taxes next year. In effort to relieve some of this burden, HB 2003 , Income Tax Code Amendments, creates a $30 million tax credit for working families in Utah. It is expected that this will directly reduce the state taxes of a family of five by $170. This bill passed both chambers. In the wake the decision of the Supreme Court of the United States in South Dakota vs. Wayfair, Inc., et. al., decided June 21, 2018; we amended the Utah Sales and Use Tax Act to allow for millions in state sales taxes to be collected on online purchases from out-of-state companies affected by this ruling. In SB 2001 , Online Sales Tax Amendments, we also allowed for exemptions in certain industries and made needed clarifications to our tax code to conform with federal tax reform. This bill passed both chambers. During the 2018 General Legislative Session, the we unanimously passed HB 303 , Drinking Water Source Sizing Requirements, which gives communities flexibility in deciding their specific water needs, rather than the one-size-fits-all status quo. However, due to an error in the process of transferring the bill to the governor for his signature, he signed the wrong version of the bill. To correct this, we reconsidered HB 2005 , Drinking Water Source Sizing Requirements, so we could send the correct version of the bill to be signed by the governor. This bill once again passed both chambers unanimously. As a part of federal tax law changes, Congress changed the repatriation tax code to allow a 50% reduction and 8 years to pay the tax as a means of incentivizing U.S. companies with assets overseas to bring those profits home to the U.S. This only applies to tax years prior to 2018. HB 2002 , Repatriation Tax Amendments, brings Utah into compliance with the federal tax law changes. This federal change was not made clear until after the conclusion of the 2018 General Legislative Session, and so we have not been able to address this issue until now. This bill passed both chambers. HB 2004 , Utah Communications Authority-Procurement, brings the Utah Communications Authority into compliance with the Utah purchasing code with clarity, so as they issue an RFP there can’t be an opposition declaring it out of compliance. UCA is about to issue a substantial contract, and this will prevent it from being contested since it will be in complete compliance with the Utah purchasing code. This bill passed both chambers. SB 2003 , Off-premise Beer Retailer Licensing Amendments, fixes and unintended consequences of the alcohol reform legislation passed during the legislative session this year. This will allow businesses to continue to receive “conditional” licenses to sell beer off-premise for events such as a “grand opening” before receiving their official off-premise beer retailer license. This bill passed unanimously in both chambers. SB 2004 , Class B And Class C Road Fund Amendments, allows counties of the fifth class (i.e. Beaver County, Grand County, etc.) the flexibility to use class B and class C road funds to maintain class D roads. This bill passed unanimously in both chambers. SB 2005 , Calculating New Damages Limits For Personal Injury Cases, clarifies the formula the legislative fiscal analyst uses for calculating periodic inflationary adjustments to the limits on damages for personal injury claims against governmental entities. This bill passed in both chambers. Connect with the Utah Senate for updates wherever you live on social media by visiting www.senatecloud.com. We’re on Facebook, Twitter, LinkedIn, Instagram, Pinterest, and all sorts of other sites. Feel free to visit our new website for updates, articles, and information: www.senatesite.com. You can find me on Facebook at: https://www.facebook.com/docbrianz/ and on Twitter at: https://twitter.com/docBrianZ. I'll try to continually keep you informed about my work on the Hill – likewise, please keep in touch – I’d love to hear your insights and opinions. I’m truly grateful for the opportunity you’ve given me to serve in this capacity. We live in a unique and special place. 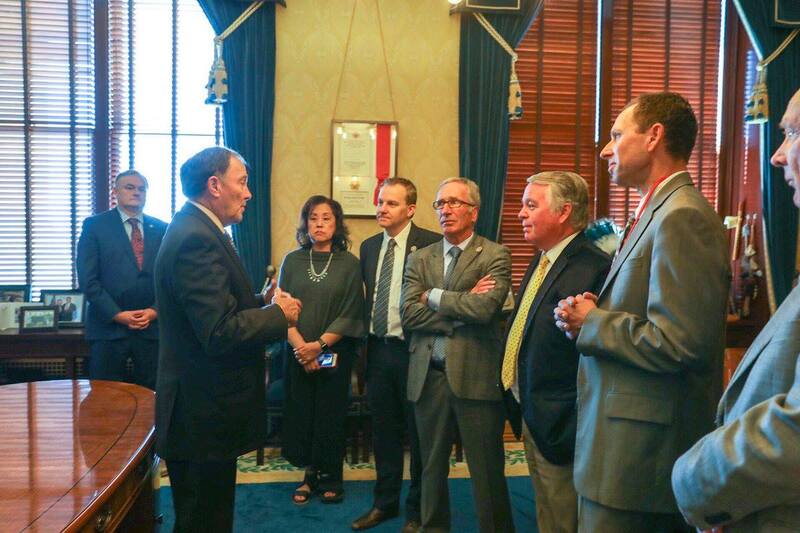 Thank you for all you do to make Utah the best state in the nation – and thanks for paying attention.